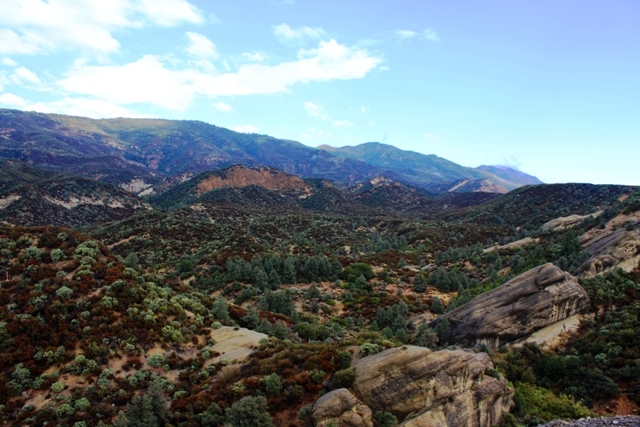 Prime fossil hunting grounds at the foot of Pine Mountain, Ventura County. With the tail end of a thunder storm swirling its way down the coast and through the area, I checked the online weather radar and saw that only a few scattered showers remained. The mountains looked surprisingly clear of rain. So I gathered my gear, loaded it up and hit the road for Pine Mountain. The showers started on the drive up HWY-33 behind Ojai. Sitting in my truck roadside a few minutes later as I pulled on my waterproof gear, the showers continued intermittently, but as I started up a creek, the rain stopped. Thirty minutes later I was sitting in a dry shelter beneath a massive wall of sandstone hiding from the sheets of rain pouring down from a grey-black sky. Figuring I had five hours of daylight left and hoping that the clouds would soon clear, I kindled a small fire, took out my thermos and Louis L’Amour novel and sat back to read and sip coffee. The rain ceased, the clouds parted to blue sky and the sun came out. I headed up a fork in the creek with the fragrance of rain soaked forest heavy in the air and the hills echoing with singing birds. It was not long, however, before I noticed the clouds gathering once more on the summit of Pine Mountain, which soon disappeared in a grey shroud of falling rain. A flash of lightning, a few heavy rain drops and then it cut loose so fast that I still had my slicker in my backpack. The thunder boomed, cracking through the sky overhead. Hastily fumbling in the downpour trying to don my jacket, I ripped the hood from the buttons by accident and had to reattach it wasting precious seconds and getting soaked. I started back down the creek slipping in the mud as torrents of chocolate milk-colored rivulets came streaming down the hillsides rapidly filling all the gullies that had been dry minutes earlier. Lightning bolts flashed down followed by thunder claps that I could feel resonating inside me. Then it started to hail. 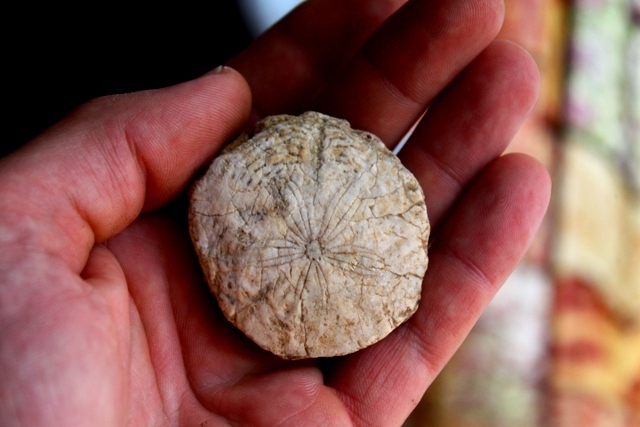 That is when I spotted a fairly nicely preserved fossilized sand dollar and knelt down to pick it up as little balls of ice slammed down all around me in the mud. The weather added an enjoyable element to the experience. The mountains were alive. There I was hunched over in a hail storm scanning the ground for fossils with thunder and lightning flashing and crashing all about. I quickly looked around the immediate area and seeing nothing of interest headed down canyon through the downpour growing a bit concerned about flash flooding. Oddly, though, I reached the end of the rush of water as it made its way down canyon and before long was hiking once more in a dry creek bed. At the confluence of two creeks that I passed earlier I found the best sand dollar specimens of the day. And as I was combing the area, I heard the sound of gurgling water begin to grow louder and before long the chocolate milk runoff was soon filling the creek bed in front of me. It was interesting to watch the process of rain and erosion unearth fossils from their subterranean tombs leaving them scattered across the mountain. The scattered showers sent a deluge flushing down the creases of the mountain, but the lower reaches of the creek were still dry as I hiked back to my truck. 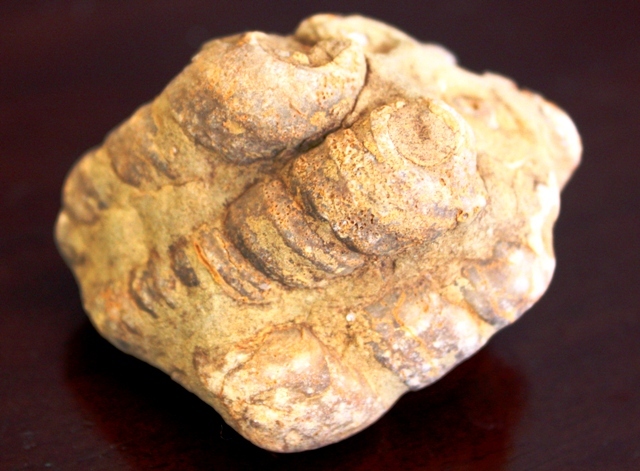 A wad of stone typical of the area with numerous fossilized conical-shaped snail shells embedded in it. Bits and pieces like this are everywhere. Finding whole specimens is not as easy. 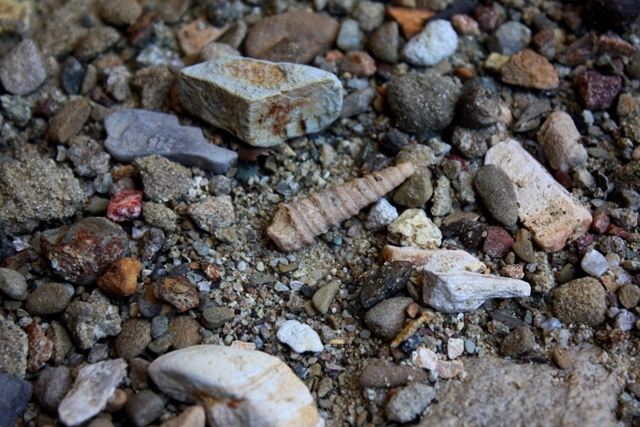 A tiny inch-long intact fossilized snail shell. This entry was posted in Ventura and tagged Fossils, HWY 33, Los Padres National Forest, Pine Mountain, Sand Dollar, Tales. Bookmark the permalink.